Astrology is often seen as a key component of western esotericism. This it may be, but this does not mean it has been a peripheral or ‘fringe’ pursuit in western history! In this episode we look at the rise of astrology in Rome, firstly in the Roman lower classes in the republican period, then into the erudite circles of the senatorial elite in the Late Republic, and finally into the very corridors of imperial power in the empire. Along the way, we trace the many attempts by the state authorities to control this powerful new science and turn its power to account for the state. Athenio’s revolt: Diod. Sic. Hist. 36.5.1-4. Diodorus tells us a lot of interesting tidbits about contemporary astrology, though he seems not to have understood it at all, so he makes plenty of mistakes as well. 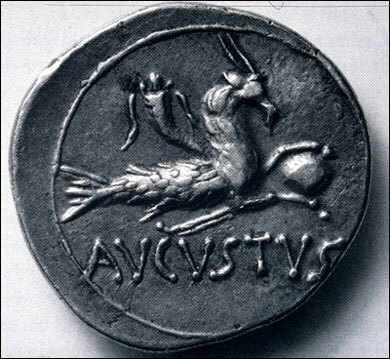 Augustus: minted coins bearing his zodiacal birth sign to promote his divinely ordained destiny to reign, even bravely publishing his horoscope with ascendant (from which his death date could be calculated) in AD 11. See Cassius Dio, Hist, 56.25. 5; Suet, Aug. 94.5. Edict of 11 CE, renewed in 52 ce by the emperor Claudius Tac., Ann. 12, 52. Cramer, F., 1954. Astrology in Roman Law and Politics. American Philosophical Society, Philadelphia, PA. We quote page 80. Ennius: mentions astrology and the zodiac, our first reference extant in Latin: Cic. Rep. I.18.30. Lucius Turutius Firmanus: the horoscope of Rome reverse-engineered: Cic. de div. 2, 47, 98; Plut. Romulus 12, 3. Pliny tells us that a Greek slave called Manilius Antiochus was brought to Rome and sort of brought astrology with him (HN 35. 199). Poseidonius of Rhodes: appears in Cicero’s On Divination, our single best source for his thought on astrology. Thrasyllus: On this interesting character, see Tarrant, H., 1993. Thrasyllan Platonism. Cornell University Press, Ithaca and London. Gundel, W. and Gundel, H., 1966. Astrologumena: die astrologische Literatur in der Antike und ihre Geschichte. F. Steiner Verlag. Posidonius: Edelstein, L. and Kidd, I. G. & Reeve, M. (Ed. ), 1988-1999. Posidonius: Volumes 1-3, The Fragments, The Commentary, The Translation of the Fragments. Cambridge University Press, Cambridge.